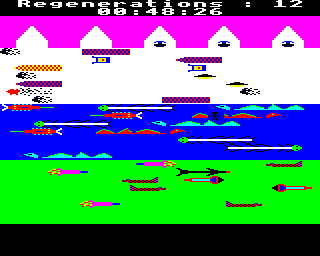 MODE 2 is a low-resolution screen MODE, introduced on the BBC Micro Model B and supported by the entire BBC series including the Archimedes. It allows colour graphics to be shown but leaves only 9 KB for programs -- even less if a disc interface or Econet is fitted. MODE 2 is the only official MODE to offer 4 bits per pixel. This was usually used to display full colour graphics; several applications (including "Island" and "Planets" from the Acorn Electron Introductory Cassette) used it for cyclic animations by reprogramming the palette several times a second. The MOS makes this convenient by offering extended paint options in GCOL and commands to redefine the palette. This page was last modified on 12 October 2016, at 20:21. This page has been accessed 2,958 times.